Banner designed by Simon Humphreys, pictures owned and supplied By Brett Hadley with thanks to Southside Wrestling Entertainment. After an excellent show the night before in Nottingham, the Southside crew move on to Huntingdon for another great card. 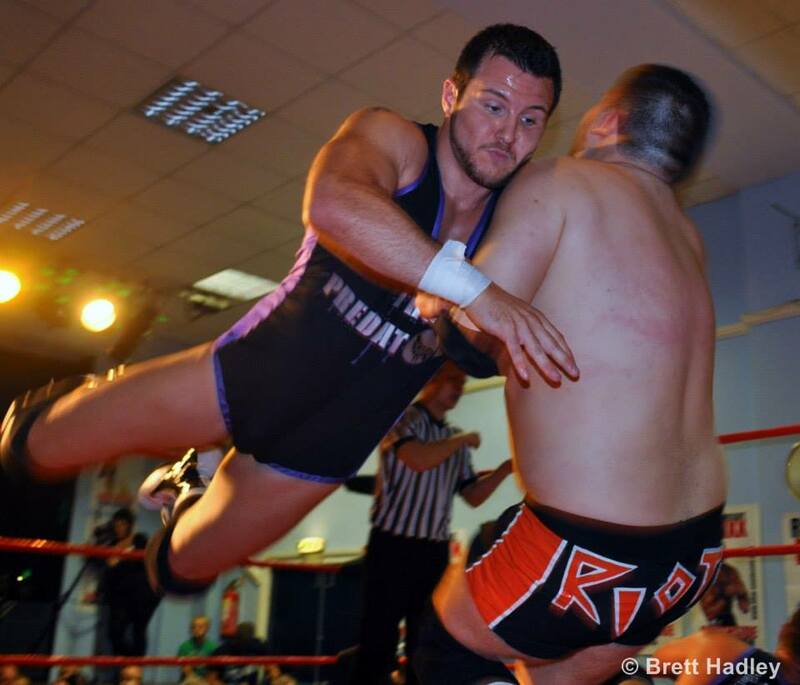 In the opening match of the night the number 1 contenders (who won the right to be No.1 contenders at the Big Bump Theory back in July) the London Riots took on the champions the Predators. From the off set the Riots took advantage of there size and used it to gain the early upper hand, hitting big move after move to keep control. But after some back and forth. Predators managed to regain control of the match, and cut off the ring so it was hard for the Riots to tag in and out. This match was supposed to be Noam Dar v Zack Sabre, but due to Dar's continuing injury, Robbie X was into Dar's place and this match did not disappoint. During the opening minutes of the match, neither man could get the advantage, with various holds being exchanged, and counter holds, it really did set the pace for the rest of the match. Zack took the early advantage, and triedto lock in the fatal armbar early, Robbie managed to scramble to the ropes both times. 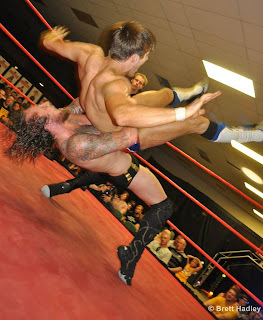 So Zack continued the onslaught with some well placed kicks to Robbies chest. But just as Zack was wearing down Robbie, he came roaring back with some high paced offense, which left Sabre down, and in trouble. X went for a few quick pins but could not gain the victory. 3. Number 1 Contenders match for the SWE tag team titles The Bhangra Knights v The Hunter Brothers. This match saw 2 teams who have both had a crack at the Tag titles, square off to see who deserved an opportunity at a rematch. It started off with some back and forth action, between both teams not willing to budge. But it was the Knights who took early advantage, and seemed eager to get there rematch. But The Hunters managed to regain the upper hand and regain control, with there quick style hitting some great tag team moves. Including scoring one near fall, on the knights. This match on paper looked great, and i must say it lived upto the hype. Both men, started very cagey and Lethal took the upper hand on Kirby. Lethal used his experience to keep on top of his oppenent for several minutes. But Kirby managed to get in control for the first time, by hitting Lethal with some hard offense. Kirby was determined to beat Lethal, and got several near falls on Jay. This match was made at Menace to Society the night before, when MK won a number one contendership match, to face off against the champ Stixx. The match started of with Stixx bragging how this was gonna be easy work and be done in 5 minutes. MK used this as fuel, and went after Stixx in the opening Minutes of the match. But the Southside champ was having none of it and took control pretty early on, throwing MK around like he was toy. After a few more minutes of action, Stixx was still in control bragging how it was nearly over to the crowd. But MK came roaring back, with some quick offense which stunned the champ, which got MK a nearfall on the champ. The crowd were solidly behind McKinnan, and one point the ref got his hand so close to 3 the crowd thought MK had won the match, but Stixx managed to kick out by the skin of his teeth. This was a fun little match, which started off with Loco making his way to ringside chucking Jaffa Cakes into the crowd. 7. No Disqualification Match: Mark "Hotdog" Haskins v Sabu v Kris Travis v Marty Scurll. This was our main event of the evening, and I must say was a really good match to round up a great night of action. Opening exchanges Scurll & Travis were working together to beat down on Haskins and Sabu, but the partnership didn't last long, as they then turned on each other and it broke down into a proper 4 way. Sabu and Travis paired off a brawled around the ring and towards the merch tables while Haskins and Marty faced off in the ring. Keeping track of the action was hard, but Haskins and Scurll were exchanging some excellent moves in the ring, while Sabu was beating down Travis including hitting a moonsault to the outside on a standing, all be it not for long Travis. After the match Haskins and Sabu shook hands and the crowd went home happy. Another great outing for Southside here. Some stella matches, and some matches that progressed stories leading into the next batch of shows. If you can try and pick up the DVD you will not be dissappointed, this was Brit wrestling at its best. Great show, and if Southside comes near you check them out. Thanks to Stu of The Indy Corner for giving me an outlet to do this. Thanks for Reading :) and see you at the shows. Tom Linberry - Follow me on twitter @mr1985TAL. Coming from The Rushcliffe Arena in Nottingham, Southside Wrestling Entertainment comeback with another stacked card. Opening match of the show, and needless to say this match set the tone for the rest of the night. It opened with a feeling out process between the 3 combatants, who were out to earn a shot at the Southside title. After the initial feeling out process, they kicked into 4th gear, with some excellent high paced moves, including MK hitting a flip dive through the ropes onto Ligero & Dunne. 2. 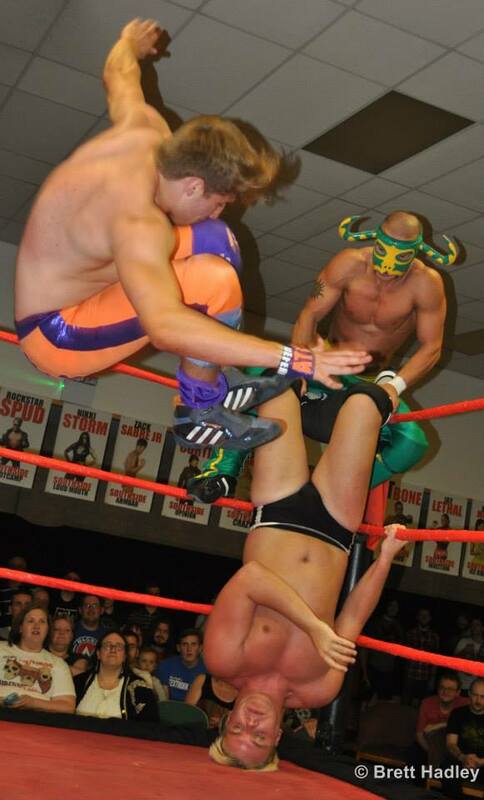 The Hunter Brothers & R J Singh v "Ego Dragon" Martin Kirby & The Predators. Next we have a 6-man, great start to the match with The Hunters getting the upper hand early on, and Singh adding to the offensive with great technical ability. This match started an peculiar note, Mr Money in the bank Mark Haskins, on his way round the ring before the match started, managed to knock a fans hotdog on the floor, to which for the rest of the match he was referred to as Hotdog Haskins. This is one of the matches I went for because I've been watching both guys for ages all over the country, and both are great talents. So after the chorus of "Hotdog Haskins" had somewhat calmed down, we got down the match. It started with both men, exchanging holds, with Haskins getting the upper hand. Stixx made his way to the ring with Harvey Dale and his Southside Heavyweight title. He proclaimed he was a huge fan of his oppenent, and he just wanted a clean fight with him. So he sent Harvey packing to the back, and Super Crazy made his entrance to a rowdy crowd. Great opening exchange with neither wrestler giving an inch. 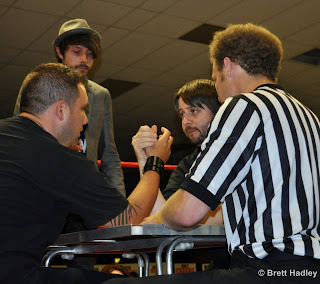 Which to everyones displeasure bought out Harvey Dale to console Stixx and stay in the corner for his match. 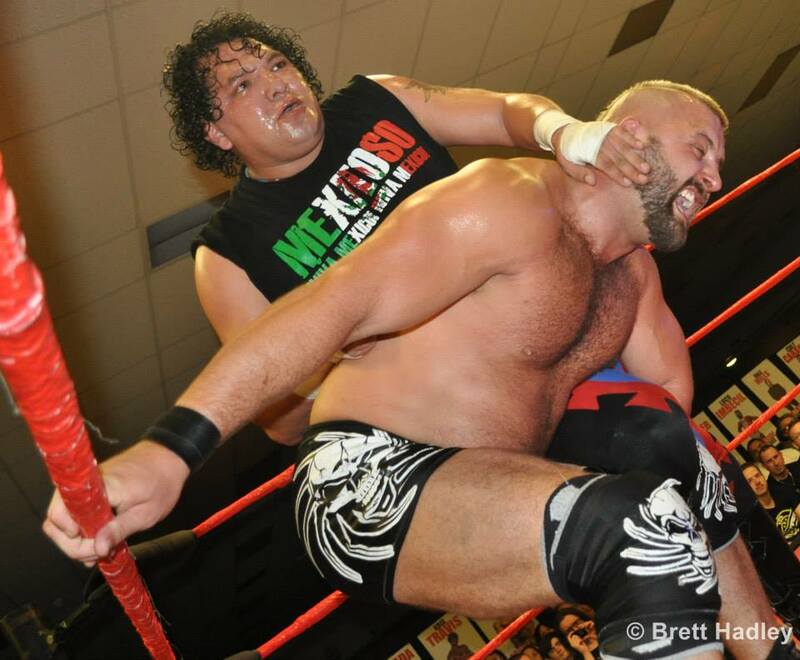 The ex ECW star Super Crazy, hit some crazy offense, to stay on top of STIXX, who was having trouble getting to grips with the Mexican's offense. 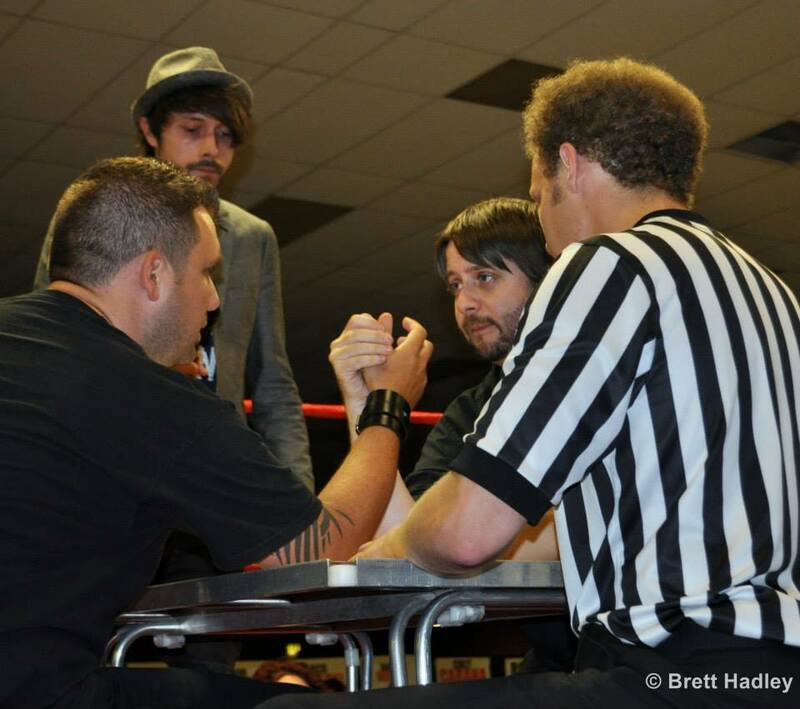 After intermission we had the arm wrestling contest between commentator Dale Mills and House of Pain advisor Harvey Dale. After much back and forth on the mic and Harvey Dale refusing to lock up they finally did. But as they did Mrs Haskins jumped up on the ring apron to distract Harvey Dale by lifting up her shirt. He was distracted just enough for Dale Mills to get the victory and claim bragging rights between the two. Jay Lethal taking on for Speed King champion Robbie X. Robbie X had lost the title at Speed Kings, so he was out to try and unseat the man who won the 6 man at Speed King back in May Jay Lethal. The crowd were hot for this match, with both guys, going all out pretty much from the bell ringing. 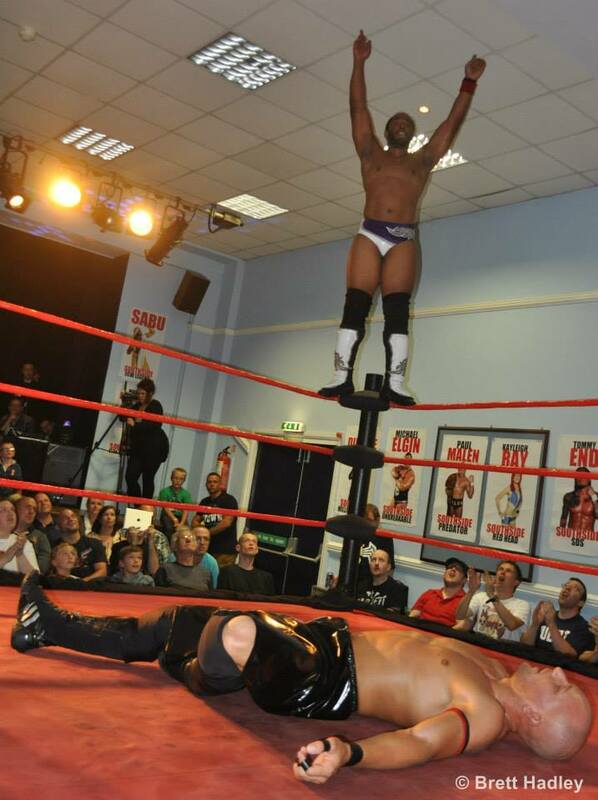 Lethal took the upper hand on the former champ, including hitting a handspring elbow. The crowd were really into this one. Robbie managed to get back into the match by hitting some quick offensive moves and take the control over Lethal. Robbie on several occassions thought he had the match won, but Lethal kept kicking out and coming back for more. Lethal who had the experience edge came back slowly but surely and managed to hit the 'Lethal Combination' but he only got a near fall. With Lethal growing frustrated, Robbie managed to make a quick comeback and nearly become Speed King champ for a second time. This match was sanctioned by wXw in Germany and was an official match and will also appear on an upcoming wXw dvd release. This match pitted 2 very well travelled men, both with experience in Japan and the USA against one another as wXw champion Tommy End took on England's own Zack Sabre Jr. Both these men have met before in wXw and wrestled in the final of this years 16 Carat Gold Tournament and on a side note of interest, Zack was the first ever unified champion in wXw. This match started very cagey, with guys hitting hard Kicks to each other. But after the opening exchange, Zack went straight for the armbar, but Tommy managed to scramble for the ropes. After the initial excahnges, Tommy tried to lock in the Dragon Slayer sleeper, but Zack managed to squirm free. With some more hard hitting strikes, Tommy hit a kick to Zack's head that dazed the former champ and may have stunned him a bit. 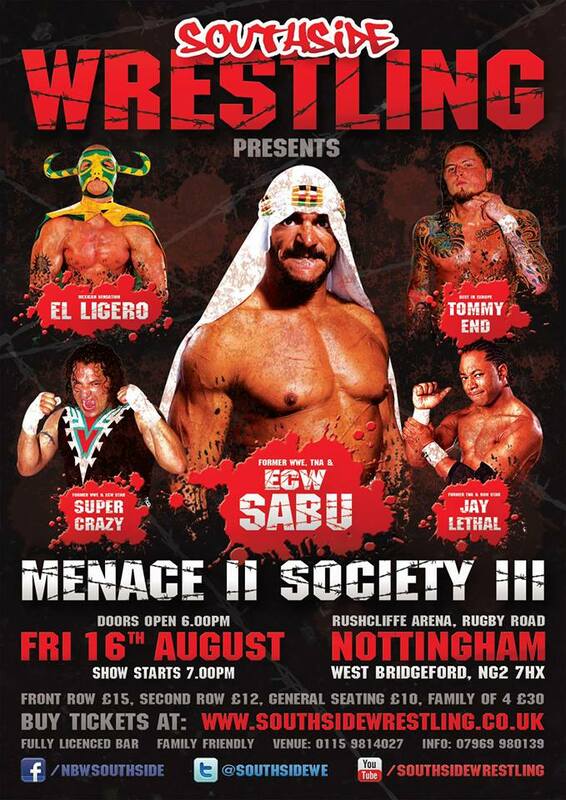 The ECW legend v Britain's own deathmatch worker. In what was the main event of the evening, Sabu went to work early on Havoc using anything that wasn't nailed down to try and keep Havoc grounded. But Havoc made a brief comeback, nailing Sabu with a few chair shots. But the ECW legend, used his experience and regained the upper hand, and took the match to the Extreme getting a table from under the ring and setting up on the outside, both brawled round the ringside and eventually Jimmy was back dropped through the set up table. Sabu threw a chair at Jimmy which cut him open deep. Sabu then promptly set Havoc up on a chair, got back in the ring and after a few attempts ran off the ropes and jumped on the chair onto the ropes and dropkicked Jimmy head first into another chair. Sabu dragged Havoc into the ring and made a pin attempt but Havoc kicked out. Another top notch show, with some great wrestling invovled. Southside is one of the top promotions in the UK and it was truly a great show and I urge you as soon as the DVD is available to buy it. It was one of those shows if you missed it, you missed out. The next Southside show in Nottingham is Crossing the Line, on September 28th, featuring CZW champ Drew Gulak, Drake Younger, Ricochet & the high flying sensation AR Fox as well s the usual Southside crew. ATTACK! Pro Wrestling created a lot of buzz earlier this year when their style was showcased in the above video. The display remains a superb mix of fun-themed humour and awe-inspiring moments, which brought tears to the eyes of those not within travelling distance of Cardiff where the promotion is based. APW answers this complaint, by literally setting stage in the middle of the UK with their visit to the Midlands. So on August 11th crowd flocked to Dudley to see if the event could live up to the hype videos. Themes are taken seriously at APW, exampled by an announcer donning a Hawaiian shirt and a lei as he enters through a blown up image of a shark's open jaws to welcome the attendance to their world. 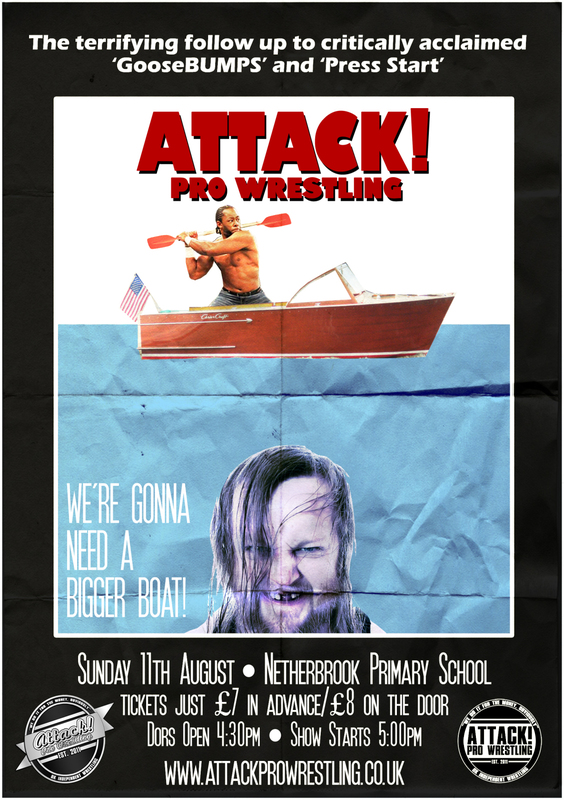 Wrestlers followed up on the antics, from summer songs as entrance themes, to beach appropriate attires, along with Jay Lethal being dubbed a boat enthusiast and what can be best described as a 'Anything From The Beach Goes' match. These quirky touches make for a fun show, and plenty of laughs come in tow. 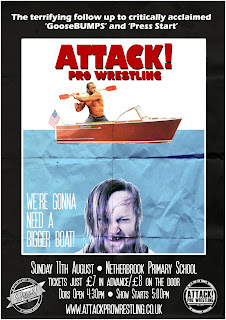 From their trailer packages, APW are expected to deliver surreal moments of unpredictable hilarity, and when surprise star Clint Margera is eaten by a shark only to return wearing the remains of his foe a match later, it can only be said that they delivered. Thanks to the W in APW a certain amount of wrestling ability is to be expected too, and on many accounts that mark was hit. Morgan Webster and Mark Andrews impressed a crowd which was not expecting to see the likes of an attempted 630 splash in a match that quickly turned from comedy to great action. It was the Wild Boar and Tyler Bate who hit a home run however, as it pitched a quality presence against a guy so local he went to the very school hosting the event. Wild Boar is fantastic on the offence, convincing with every strike and move he uses, but Bate is full of ability and gradually got the crowd behind him and to their loudest point of the show as everyone rallied up for his array of moves including the execution of a 450 splash. At sixteen, Tyler is an incredibly promising talent and an example of the roster APW puts together. The already mentioned Jay Lethal was a guest addition, who reeled of all his signatures manoeuvres for the fan's appreciation in a match against the very capable 'Dynamite' Pete Dunne. Clint Margera's surprise appearance was also a treat as he transferred his skills from deathmatch specialist to comedy antics, and on that humour front came a team that stole the show, not least thanks to Damien Dunne's partner Ryan Smile spouting comedy gold at every given opportunity. Chris Brookes also put in a good showing in an opener that did well for setting the shows tone, rounding out a robust roster featuring star highlights and flexible talents. 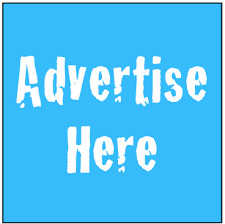 There are many unremarkable promotions around today that become clouded in the mist of similarity. ATTACK! 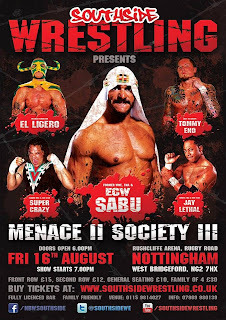 Pro Wrestling is something different for the UK wrestling scene, not only stand out but at the top of their game and more giving than a handful of examples in this article can convey. They provide a great showing of comedy, often topped off with superb wrestling content and it's serve you well to attend their event if you like your wrestling fun.